from robert crumb to robert johnson, my friend’s fb post took me on quite a little journey today…. it started out innocently enough with a post from my friend stephen, of an interview with r. crumb. in this interview, he spoke about his love of early authentic american music. that site led me to an interview with john fogerty about the epiphany he had while visiting johnson’s grave. on that very page, there was a quote from langston hughes about the blues. a beautiful paragraph that was part of a letter he wrote to carl van vechten. all the while this one photo of johnson kept popping up in my head, not that there are many to choose from. i have not put pencil or brush to paper in almost a month, until today. my first attempt was rusty so i did what any good artist does and flipped the paper over and started again. the result is above. did i capture a feeling? hit or miss? 06 Dec	This entry was published on December 6, 2013 at 8:08 pm. 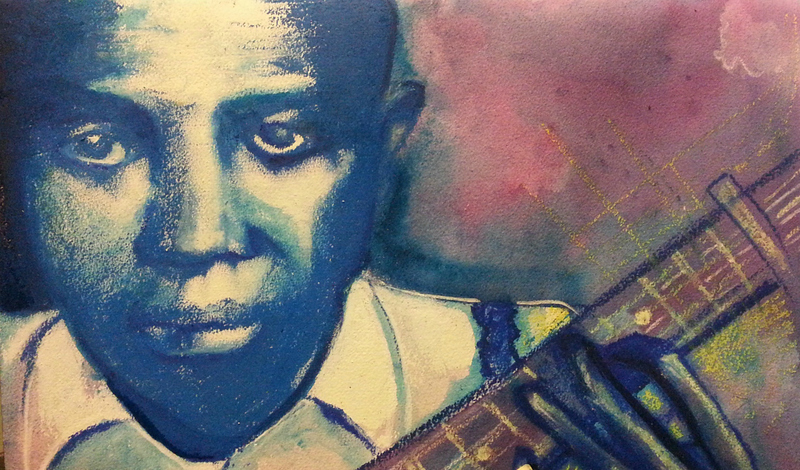 It’s filed under artwork and tagged art, blues, chicago, delta blues, facebook, guitar, love, music, pastels, portrait, robert crumb, robert johnson, watercolor. Bookmark the permalink. Follow any comments here with the RSS feed for this post. Newer: Sunday 1/19/2014 – live jazz in williamsburg, tix on sale now!